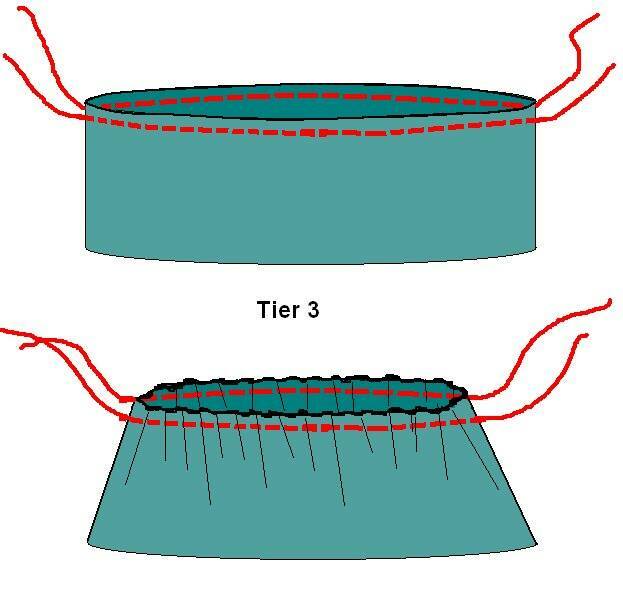 Cut the three tiers with the help of above picture. 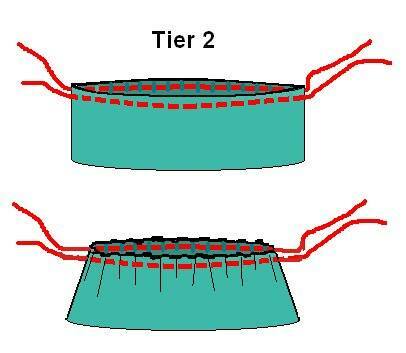 Notch or mark the top and bottom of each piece at the center to help you when you gather each tier. Step 1: Sew each of the side seams together using a 1cm seam allowance. After sewing press seams. 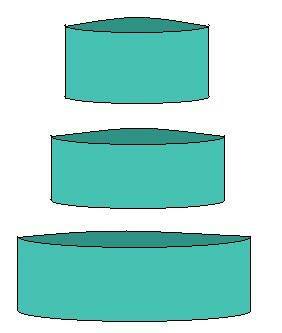 Now we are going to work with three tiers that are each a different size circle. Step 2: Gather the 2nd tier with the longest stitch. Stitch within the 1cm seam allowance around the top of the 2nd tier. 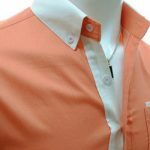 Do not back stitch with your machine and keep the threads long at the starting and ending point. Step 3: Repeat the last step to make gathers in 3rd tier. Step 4: Pin the center of the 2nd tier front to the center of the 1st tier front by facing right sides together with using the notch. 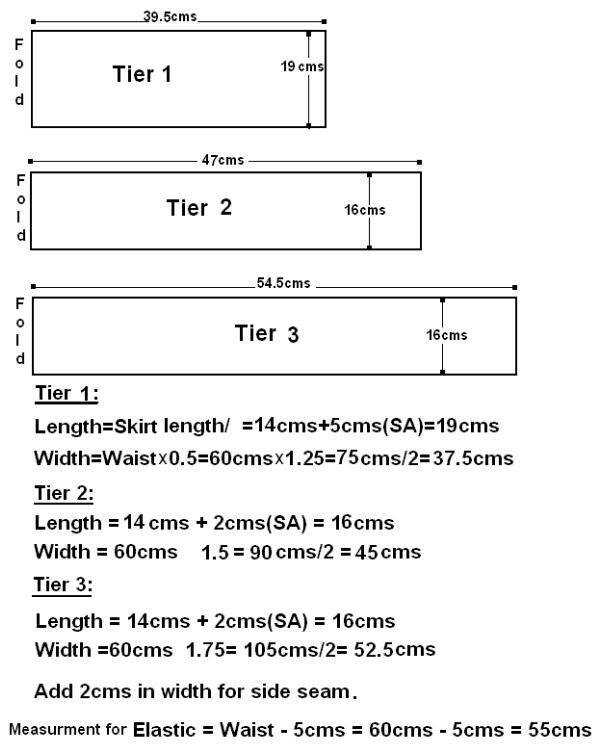 Stitch the two tiers together, using a 1cm seam allowance. Match the side seams together. (If u need gently adjust your gathers until the two tiers will sew together). 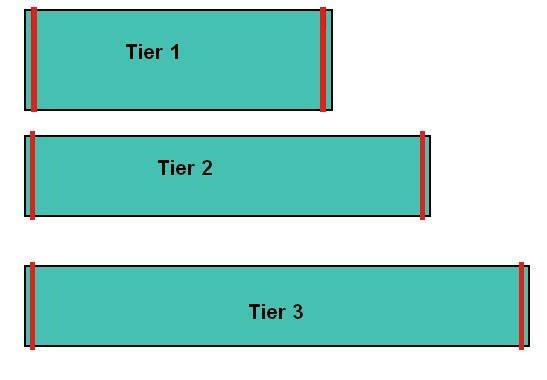 Repeat this step to attach 3rd tier to the 2nd tier. 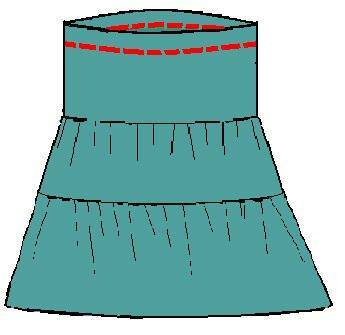 Turn skirt right side out and press. Topstitch the seam allowance to the upper tier. 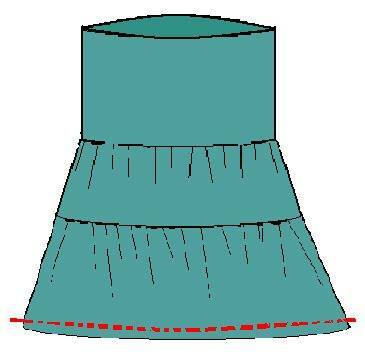 On hemline fold 1cm inside & press again fold 1cm (double folding) inside and press. Then sew along the hemline. Step 5: To put in the elastic waist, fold down the top of the first tier 1cm & press, then again fold down 4cms towards the inside of the skirt & Press. Now Sew along the red line mentioned in the above picture (leave 3cms as unstitched to insert the elastic). Step 6: Take 55cms 1” elastic. Insert the one end of elastic to the waist line with the help of 3cms gape. Join the elastic sides together by stitching. Finish the unstitched gape. Now the Tiered Skirt is ready to wear. Note: you can use 3 different colors, plain or printed with combinations. 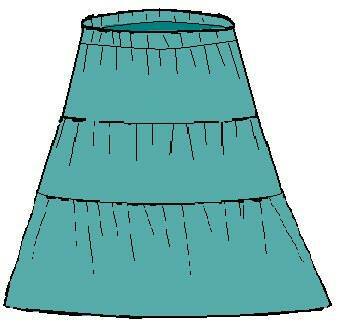 Thank you very much, Keerthi for sharing this, making a 3-tier skirt. I appreciate it. God bless you for everything, including your time. 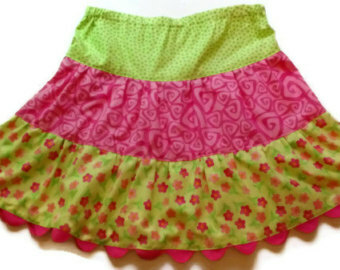 Is this a gathered tier skirt ?